Last summer, I went for a walk at an Italian marina, which is very close to my heart. I often come back to this special place, that’s where my roots are, where my ocean is. I often talked to my father about my extensive experiences and efforts and about how my passion for music finally became my beloved profession. Argentina when I was a child, Italy when I was a teenager, different jobs, all my travelling and my studies, the music and finally love and family in Austria, my profession….and stability. What a long and stony way! Finally we set down on a bench, observing the sea and the never-ending horizon, enjoying the sounds of the sea. We were listening to it in quiet humility. Suddenly, a bizarre dream came over me, born from this rhythmic rushing of the sea and I had the idea to create something new, something inventive and different. I dreamt of a new “journey”. A new CD. “Dear Lito, use all your strength, think and act „doing it your way“, without any doubt nor fear. Never abandon your dreams, even if they will bring changes.” My dream appeared so clearly: to bring new music to my beloved Brass Bands. It was time to combine the Latin-American style with the typical concert musicality of a Brass Band. It was time to integrate new instruments for a clear expression of time and different rhythm…it was time to transmit “caliente” charm and vivacity! For me it was time to go back to the roots!!! I will never know if it was the sun of that hot day or just recklessness to blind me…who knows if this dream would have ever come true. Thousands of questions were swirling through my head. I urgently had to find an answer. Robert Childs is a great conductor whom I have always admired. It was one of my dreams to be conducted by him. Bob is a musician who worked his way up with humility, gaining a lot of experience due to his high engagement and his talent. He is distinguished by his great humanity, he is a very correct person, able to help, able to make people feel completely at ease and able to explain in a calm way and with gentleness, transmitting confidence and positive energy. For this reason I called him without hesitation and shared my dream with him…this was his immediate reaction: Your project sounds exciting and I particularly like the idea of recording South American repertoire. This is something I would like to do. This dream started being contagious…Bob and I immediately started to discuss which Brass Band would be the best choice for making this infection become an epidemic!!! 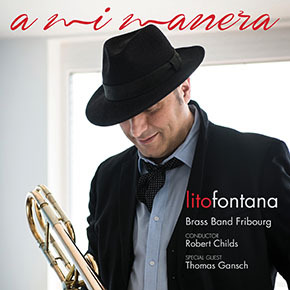 What about the Brass Band Fribourg? 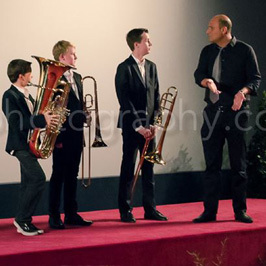 - I asked The Brass Band Fribourg is an excellent band and they are super people, too. 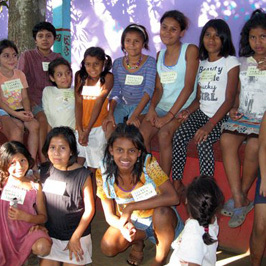 I have been working with them since 2000, so I know the organization very well. They will take the project very seriously. – was the immediate answer! No sooner said than done: the Brass Band became a part of the group and the dream, which started coming true…in steps of 35 elements! All members of the Brass Band Fribourg are great people who had the enthusiasm and the courage to explore completely new pathways. They practiced again and again difficult and unusual pieces of music, sharing notes and more with new musicians and instruments! They all adapted themselves with big efforts to an unusual musical phrase! Frédéric Théodoloz assisted them, playing a significant and discreet role. He worked with respect and humility all the time together with this incredible group. Later on he applied himself to the recording with due diligence! His presence turned out to be extremely useful. My dream started getting concrete, now I could perceive the sounding audio response!!! We were united by a natural harmony…and it was not only musical…I am talking about that kind of harmony, which unites people who have a dream in common. Thomas Gansch was my “wish”. For a composition I particularly love, I felt the necessity to play it together with a musician in my same style and my same strength. In fact, his way of interpreting is similar to mine…he is a perfect partner. 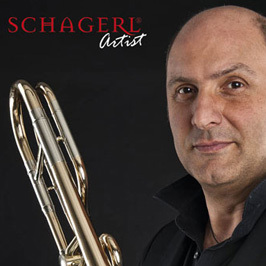 He is a precious and energetic trumpeter, who generously and masterly helped this dream coming true! Regis Gobbet played a very important and irreplaceable role concerning organization and mediation, giving us so much energy and inspiration. Joe Laube was a major driving force of highest professionalism, whose contribution was very meaningful. Thanks for his careful operating procedures of mixing and mastering! Without them, this dream would not have come true and there would not be any story to tell. If we now want to talk about style, I do not have to forget who helped me presenting myself as good as possible…as sometimes music is not enough and we need to create a picture for being present in everybody’s mind. Elsa Bral and Roberta Gobbo who coordinated the visual communication, together with the staff of Wedot. Alessia Vitti created my new style with patience and regard. Finally, Fabrizia Costa who masterly immortalized my emotion of happiness ;). I would like to thank everybody for making this dream coming true with such explosiveness. Our aim is to wrap our listeners and everybody, who believed in this dream from the very beginning, into the energy of Latin-American music! Thank you to my wife, my children and my mother who have always supported and respected me. They distract me from my worries, creating a serene atmosphere within the family. Dad, thank you so much – almost one year has passed now since your words of encouragement – and I have to admit that you were right. Now that you are no longer with us, I can strongly feel your legacy: to love my roots and to express myself with courage “a mi manera – doing it my way”. Keep following me forever! 13 Concert as soloist with Synphonic Winds SBO RIED in Ried in Innkreis under conductor Karl Geroldinger. 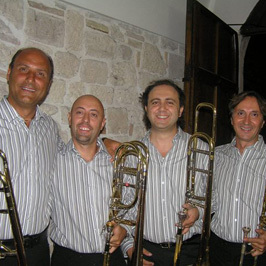 29 Concert as soloist in Castignano ( AP) Italy with the Banda di Castignano.